We are a couple of independent middle-aged travellers. This blog shares our international travelling experiences together. We have both travelled extensively in our youth across the globe for long periods of time. We still love travelling but together we are doing it differently now. We started documenting our travels from our 40s and are continuing on into our 50s. Mike loves photography and I love writing so we have combined the two skills in this blog. I hope you enjoy it and if you have any questions or comments please let us know using the form below. We don’t post often as we like returning to home base in Australia. So we post only when we travel. It’s a lovely way to reflect on our day with all the new sights and sounds that the joys and challenges of travel bring. 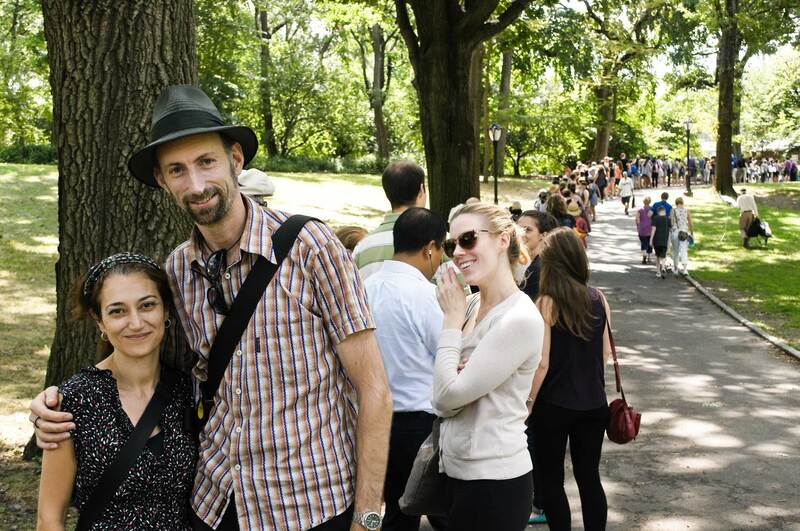 Us in the queue waiting for Shakespeare In The Park tickets. This was the point just after everyone stood up from recumbent and semi-recumbent positions under sleeping bags and sitting on all manner of folding chairs. This is a personal blog written and edited by us. You have permission to share freely. You do not have permission to share for commercial purposes or adapt and modify any content for commercial purposes. Please contact us using the form below if you are not sure or if you wish to advertise or promote your travel services. Any advertising that is permitted, however, will not influence our content. This image by Mike Buick is licensed under a Creative Commons Attribution-NonCommercial-NoDerivatives 4.0 International License. Based on work at https://ourtravelphotography.wordpress.com/.